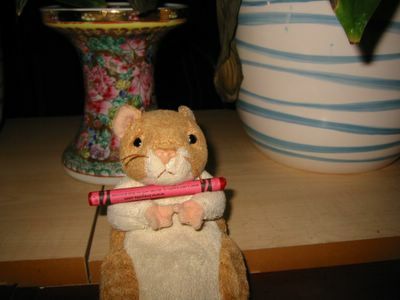 It's that Sugar High Fridays #2sweet tooth event again, a spin-off from Is My Blog Burning? and hosted by the Domestic Goddess. Food bloggers are cajoled to post their creation on a certain day (of course a Friday) based on a certain theme. For #2 Jennifer chose apples. I was originally planning on doing small individual apple strudel but decided that they're quite tedious to do. 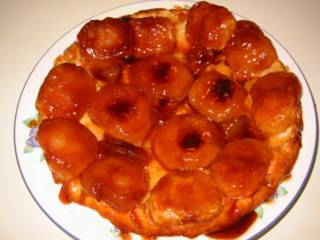 I was reading Baby Rambutan's blog where she mention Tarte Tatin and I thought what a great idea! On to the baking, first I have to buy a skillet. We were at an outlet mall in the middle of Kent when I saw that there was a Le Creuset shop there. With my husband and kids in tow, I marched in and was greeted by the amiable shop assistant. She could probably see that steely determination in my eyes to walk off with a skillet. 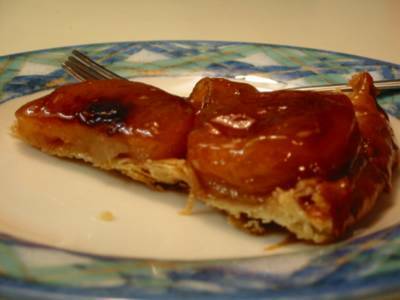 And my oh my, I saw my tarte tatin pan - not exactly skillet but more like a cake pan in cast iron with handles on the side. It can be used as a pot cover (if you buy the pot), a skillet, or a baking pan. Wonderful! Not only that, it's 50% off. Oh I'm in retail heaven! Out came the card from the wallet, kerchinggg! And I went home with my new cast iron pan grinning. No matter that I originally intended to buy shoes, but a cast iron pan is just as good although I can't wear it! Hehehe! Next is the recipe, I found one in Delia Smith's How to Cook - Book 3. Very few ingredients and I hoped easy to make. It says in the original recipe to have 25 gm butter and 25 gm lard for the crust. Well I don't have lard so I just used 50 gm of butter. It was surprisingly easy to make. 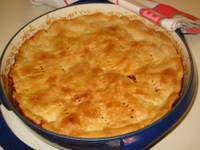 Except for the slight kneading and the peeling and coring apples it was quite straight forward. It needed some patience though, because in simmering the apples you have to start at very low heat. So it took about 10 minutes before you see some bubbles to come up. Then after that you have to watch it like a hawk when the heat is turned up otherwise you will end up with Tarte Burned. But it was really quite easy to make and that is coming from a baking klutz like me. This is how it looks like when you put in the rolled pastry on top, prick it all over and bake it for 25 minutes. As you can see the finished product on a plate looked sunken in the middle because I don't have a flat plate big enough for it. When I tasted it though, my oh my, it was really great! It would have been better if I had some whipped cream around. The caramelised sugar is similar to the that of the karyoka in the Philippines (skewered puffed glutinous rice balls with caramelised muscovado sugar sauce). Even my finicky son loved it but said he preferred just the crust with the syrupy sauce. The down side of it is that you have to serve it while still very warm because the sauce will harden as it cools - and it hardens quite a lot. I felt really pleased, afterall this is one of those rare occassions that I baked it right the first time! Sift the flour into a large mixing bowl from a height (to air it). Cut the fats into the flour with a knife (or pastry cutter), before rubbing the mixture lightly with your fingertips, lifting everything up and letting it fall back into the bowl to give it a good airing. When the mixture reaches the crumb stage, sprinkle in enough of the cold water, to bring it together to a smooth dough that leaves the sides of the bowl absolutely clean, with no crumbs left. Lightly knead to bring it fully together, then place the pastry in a plastic food bag and chill it in the fridge for 30 minutes. Peel the apples and cut them in half (or quarter) vertically and remove the core and pips. Spread the softened butter evenly over the base of the pan and sprinkle the sugar on top. Place the apples in concentric circles, cut side up. When you get to the centre you may have to cut them into quarters to fill in any gaps. Put pan over a low heat so the butter and sugar melt very slowly together. This might take around 8-10 minutes. Preheat oven to 425°F/220°C/fan 200°C/gas mark 7. Increase the heat slightly to make the sugar to caramelise. Watch it carefully and gently shake it from time to time so the apples do not stick and burn. 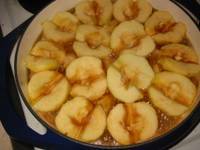 Cook until the apples are soft but still retain their shape and the sugar a rich amber colour. This will take about 20-25 minutes. Remove from heat. Fit it over the top of the pan allowing some to tuck down at the edge. Prick the the pastry base all over with a fork so the steam is released and the pastry don't go soggy. Place the pan in the centre shelf of the oven and bake for 20-25 minutes or until the pastry is crisp and golden brown. Remove from oven and allow it to cool for 5 minutes. Get a plate larger than the pan and put it on top (top side down). Holding both the pan and plate with gloves, invert the pan onto the plate giving it a little shake before. Serve the tart warm with some creme fraiche or whipped cream. Yum!